When the necessary precautions are ignored, printed circuit board hardware design and manufacturing processes are prone to fail. Design oversights such as inaccurate measurements and insufficient clearances can lead to printed circuit board (PCB) problems that impact final product performance. Catastrophic failures may result from over-etching and errors in drilling, as well as quality concerns in the manufacturing process. With Freedom CAD Services’ knowledge and experience of PCB manufacturing, we’ll prevent these common errors by identifying issues throughout the process to create an efficient end design. Technical problems lead to poorly performing PCBs. We’ve identified four key technical issues affecting printed circuit board hardware design and work to avoid them to produce high-functioning end products. For efficient transmission, high-speed signals must follow the most direct available path. Because of this, these designs should be focused on high-frequency crystal routing. While most microcontroller printed circuit board hardware designs rarely need numerous high-speed signals, trace paths are critical in products using high-speed microprocessors with an external data and address bus. Electronic designs utilize two types of voltage regulators: linear regulators and switching regulators. Linear regulators offer lower energy efficiency, but in specific PCB designs, their low cost and simple layout makes their use attractive. Linear regulators are more critical in applications involving low noise or high power. Switching regulators are far more complex compared to linear regulators. While they are more energy-efficient, switching regulators demand more detailed PCB design attention. In this case, it’s critical to stick closely to datasheet guidelines. PCB electrical components require a stable and reliable source of voltage. To facilitate stable currents, printed circuit board hardware design incorporates decoupling capacitors on the power supply rail. Placing decoupling capacitors as near to the pin as possible maximizes efficiency, so current can cycle through the decoupling capacitor before reaching the pin. If a PCB trace is required to process current higher than a few hundred milliamps, minimum trace width is not sufficient to perform this function. Freedom CAD Services’ engineers ensure accurate calculations using a trace width calculator. Acceptable temperature rise is also specified for particular traces, allowing engineers to calculate the trace’s current carrying capacity to select the proper copper weight. Printed circuit board hardware design is complex, and these aren’t the only technical problems that need to be monitored. 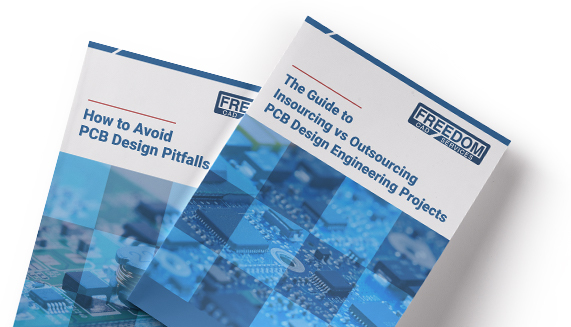 Download our eBook “How to Avoid PCB Design Project Pitfalls” to learn more about what else to look out for, including common mistakes and non-technical issues, to achieve a problem-free project. If you have questions about undertaking a printed circuit board design project or want to outsource a specific job, contact Freedom CAD Services to learn more about the company’s process.